Massage therapy has the potential to benefit people who have experienced any type of trauma. For veterans who are having trouble reacclimating to civilian life, massage therapy may help them let their guard down. Refugees, survivors of abuse, and accident victims may also benefit from the care and support that can come from massage therapy. Many experts refer to the mental and physical repercussions of traumatic events as posttraumatic stress (PTSD). When people experience dramatic and intense stress, their bodies and minds may respond with PTSD symptoms. When they return to everyday life and routine activities, they often need help to turn off the coping mechanisms they may have developed in response to the trauma. According to the U.S. Department of Veterans Affairs (VA), 10-20% of combat veterans experience PTSD in any given year. However, military personnel often describe a culture of self-repression that keeps them from reporting and working through their PTSD symptoms. Many soldiers want to be seen as strong and valuable members of their units, so they may not ask for help when they need it most. PTSD is a common response to a traumatic event, not an indicator of weakness. More than 50% of Americans experience abuse, accidents, and assaults, or witness the injury or death of others. Roughly 4% of men and 10% of women will experience PTSD at some time in their lives. 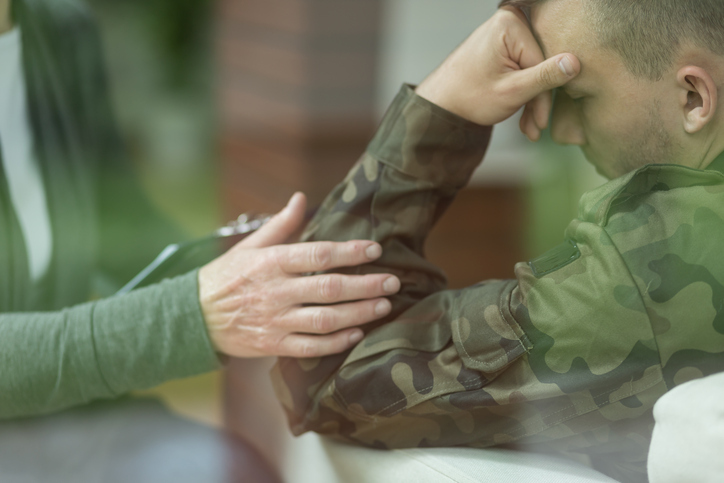 If you have PTSD, you’re not alone, and massage therapy may be an effective treatment option to help manage symptoms. Hypervigilance– Veterans and others who have endured trauma may have trouble turning off the fight or flight response state. The brain can trigger powerful fear responses that make it difficult to trust others. Insomnia – Many people with PTSD have trouble sleeping and may experience nightmares. They may feel agitated and unable to settle down. Depression – People with PTSD commonly withdraw from others and may have thoughts of suicide. They may lose interest in activities they used to enjoy, and they might have changes in behavior. Substance abuse – Studies of PTSD have shown high rates of substance abuse among those diagnosed with PTSD. For example, one study found as much as 80% of Vietnam veterans in treatment for PTSD abused alcohol and other drugs. However, increased acceptance of the diagnosis in recent decades has led to a decline in these numbers. Emotional triggers – People who have experienced trauma may show extreme sensitivity to similar events or startle more easily than others. People with PTSD often display irritability, anger, and other outbursts of negative emotion. Immune disorders – Those who experience trauma and find it hard to shut off their fight or flight response state often have an excess of cortisol in their systems. This stress hormone represses the immune system and prepares the fight or flight response, even when conditions are stable. As researchers learn more about PTSD, they continue to point out the usefulness of massage for those who have been exposed to trauma. Massage therapists can help trauma survivors reset their fight or flight mechanisms, ease hypervigilance, and begin to move forward with their lives. Massage treatments typically work well in combination with other treatment methods such as psychotherapy. For example, one study examined a group of 14 female veterans with PTSD who used prescription painkillers. Seven women received only standard treatments; the other seven underwent eight weeks of massage, inner-body awareness, and talk therapies. The women in the massage group experienced pain relief, relaxation, feelings of safety, and a new sense of trust. One study participant pointed out how well her massage treatments complemented her inner-body awareness sessions. Regular massage therapy provided short-term relief from chronic pain and tension so she could address the underlying causes of the stress with other therapists. Another study focused on the effects of massage therapy and other complementary treatments for survivors of refugee traumas, child abuse, torture, and other traumatic situations. They highlighted the effectiveness of massage for treating people with PTSD, depression, and chronic pain. To explore the effects massage therapy could have on trauma survivors, Seattle’s Harborview Medical Center formed a wellness group for Somali refugee women. These women were exposed to the trauma of more than two decades of civil war and experienced lingering pain and psychological issues. Harborview Medical Center decided to offer a program of massage therapy and yoga to address the women’s chronic pain and emotional concerns. The program has grown in popularity as it continues to offer an option for pain relief and health education to Somali women in Seattle. In another example of massage therapy’s effect on trauma, a team of German researchers interviewed a shiatsu massage therapist who treated soldiers who had returned home from conflict in Afghanistan, as well as children and young adults from war zones. The researchers learned massage therapy can treat the body/mind disassociation that often results from PTSD, unlock emotional energy, and maintain healthy relationships. Even those scarred by war and other traumas were able to recognize a healing connection between mind and body through massage. If you think you or a loved one has PTSD, talk with your doctor immediately before seeking a massage. Massage therapy might be a beneficial complementary treatment to help ease symptoms. Dryden, T. & Fitch, P. (2000). Recovering body and soul from post-traumatic stress disorder. Massage Therapy Journal, (46), 133-19. Ferguson, P., Persinger, D., & Steele, M. (2010). Resolving dilemmas through bodywork. Journal of Therapeutic Massage and Bodywork, 3(1), 41–47. Longacre, M., Silver-Highfield, E., Lama, P., & Grodin, M. (2012). Complementary and alternative medicine in the treatment of refugees and survivors of torture: A review and proposal for action. Torture: Quarterly Journal on Rehabilitation of Torture Victims and Prevention of Torture, 22(1), 38-57. Meisler, A. (1996). Trauma, PTSD, and substance abuse. The national center for post-traumatic stress disorder. PTSD Research Quarterly, 7(4). Price, C., McBride, B., Hyerle, L., & Kivlahan, D. (2011). Mindful awareness in body-oriented therapy for female veterans with post-traumatic stress disorder taking prescription analgesics for chronic pain: a feasibility study. Alternative Therapies in Health and Medicine, 13(6): 32–40. Wall, D. (2010). Massage combats PTSD. Massage Today, 10(12). Previous Previous post: Can Massage Therapy Help with Chronic Pain Management? Learn important aspects of on-site, off-site, and business directory marketing. Download the guide for free today!